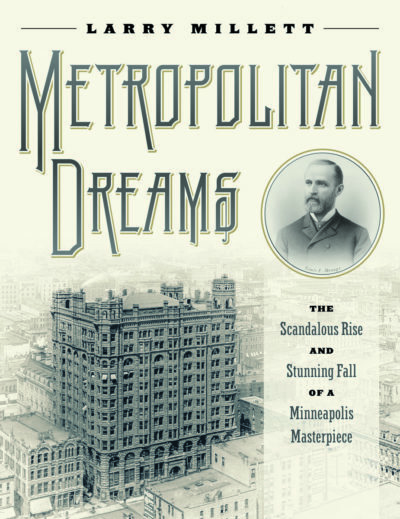 Author and historian Brian McMahon discussed how the Ford Motor Company transformed Minnesota and Ramsey County over the past 100 years, detailed in his new book, The Ford Century in Minnesota. Books will be available for signing. Archaeologist Jeremy Nienow presented findings from last summer’s 2016 volunteer archaeological survey around Lake Vadnais with the North Lake Owasso Neighborhood Group. Presentation sponsored by the Shoreview Historical Society. William T. (Billy) and Nellie Francis were “The Golden Couple” in Ramsey County in the 1920’s. They were good-looking, intelligent, talented, ambitious, and successful. Then they went to Africa, and things went terribly wrong. Stephen Osman discussed the role of Fort Snelling as a major military station in Minnesota during the Civil War, and presented his new book, Fort Snelling and the Civil War, released by the Ramsey County Historical Society. Books are available through RCHS, to purchase Fort Snelling and the Civil War through RCHS, click here. Throughout the years various individuals have reported archaeological finds and sites to professors, archaeologists, the historical society and others. A few of them become “alpha sites” or site leads that archaeologists could one day explore. Archaeologist Jeremy Nienow discussed the alpha sites of Ramsey County, and a potential new program which may take a closer look at some of these. Ethel Hall Stewart was a historian, a preservationist, a community organizer and a force of nature. Author and historian Steve Trimble presented Mrs. Stewart’s work in preserving the Gibbs Farm, founding the Ramsey County Historical Society and her contributions to the history of Ramsey County. Working on any book provides plenty of surprising moments for the author. David Page looked at the moments when he discovered information that momentarily stunned him during the writing of his new book, F. Scott Fitzgerald in Minnesota. These “Aha” moments may have initially been a revelation, but in hindsight they made perfect sense. The History Revealed August presentation featured historian and author Eileen MCormack presenting an overview of James J. Hill, and how he impacted early Saint Paul and became a national figure in business and transportation. The program also looked at his personal life and that of his wife Mary, and how their son Louis carried on the Hill family legacy in Saint Paul. Dr. John Anfinson examined the origins of the Minneapolis and St. Paul water supply systems. Unknowingly, the two cities became a human experiment about the consequences of taking our drinking water for granted and of ignoring obvious solutions. Anfinson set the Twin Cities in the context of water supply development in the nation, and reminds us of how far we have come, but we should not forget where our water comes from and what might be in it. Krista Finstad Hanson presented an illustrated talk tracing the history and variety of Minnesota’s historic house museums — from majestic landmarks like Duluth’s Glensheen Mansion and St. Paul’s James J. Hill House, to smaller residences lovingly restored by local communities and historical societies like the Gibbs Farm in Falcon Heights. Melvin Maas served in both world wars, won three combat medals, went blind in middle age, worked many years for America’s handicapped citizens, and told a few tall tales. Oh, yes, and though he was a conservative Republican, he represented St. Paul in Congress throughout the era of the New Deal. Meet the surprising Melvin Maas in this fascinating talk by Paul Nelson. John Watson Milton will present the story of Nick Coleman, the son of Irish immigrants who became a Minnesota Congressman in the 1970’s. Coleman was instrumental in changing the Minnesota legislative branch and its agenda to a more progressive and respected one. Minnesota Caves: History and Lore (Arcadia Publishing, 2017) is Greg’s third book on caves and the first book on this exact topic in 50 years. This powerpoint tour of Greg’s explorations into Minnesota caves highlights the caves with significant narrative history, illustrated with historic images, never before published, from the National Cave Museum in Kentucky. While most of the caves still exist, many are not publicly accessible, and some never did exist except in the minds of explorers. In ten unsuccessful runs at the U.S. Presidency, Harold Stassen became infamous as a perennial candidate. But his lifetime of achievements, as Minnesota’s “boy governor,” as a war hero, as a founder of the United Nations, as a nationally prominent Republican – are now mostly forgotten. Steve Werle re-introduced us to Harold Stassen, his life, and his legacy in this presentation. RCHS Curator and Archivist Mollie Spillman will show you the resources that can be found in the RCHS collections and in other places, including building permits, plat maps, photos, and more. Roseville Library, 2180 Hamline Ave N, Roseville, MN 55113. Free and open to all. James Marrinan and Bonnie Lindberg looked at the antiques and historic pieces that were brought in helped the owners decipher the history and background of their treasures. In 1920 for a nickel fare the 1,100 streetcars of the Twin City Rapid Transit Company carried 238 million riders on a 500-mile system that stretched from Lake Minnetonka to the St. Croix River, and had over 4,000 workers. John Diers re-introduced us to one of the finest transit systems ever in existence. Historian and author Paul Nelson led a one-hour walking tour to discover the geologic “rocky roots” of downtown Saint Paul, visiting several historic buildings, and looking at geologic formations along the way. Through autobiographical accounts Terry Swanson examined the life and times of Elaine Goodale Eastman, the first white woman to teach Native American students at South Dakota reservations. Author Scott Carlson led us on a tour of the history of beer, beer producers and microbrewries in the Twin Cities, with selections from his new book, Twin Cities Beer. Peter Rachleff discussed the history of Swede Hollow, and the various immigrant groups that called it home. He also presented how those groups cahnged the history of St. Paul’s East Side. Walking tour will be re-scheduled due to weather. Historian and author Paul Nelson gave an overview of Frederick McGhee, one of Minnesota’s earliest African-American leaders. Roseville Library, 2180 Hamline Ave N, Roseville MN 55113. Free and open to all. Historical overview of the role that the State Fair and its grounds played in the lives of soldiers and civilians alike during WWI. Stephen Osman, author of Fort Snelling and the Civil War, presented the daily lives of the soldiers and civilians, including hte Native Americans, that were at Fort Snelling during the Civil War. Grant Merrit, environmentalist, author and attorney, talked about his life and work defending Minnesota’s environment, including a number of ground-breaking court cases. Tom Schroeder, proprietor of Waldmann’s Brewery & Wurstery, will be offered a presentation and beer tasting at Gibbs Farm, discussing the styles and techniques of the beers and ales that the pioneers brewed on their farms and small businesses. The history and rehabilitation of this iconic building was revealed in a presentation from Denis P. Gardner, Minnesota’s National Register Historian at the Minnesota State Historic Preservation Office. Denis will be coming to the Roseville Library on January 24, 2019 to discus the National Register of Historic Places. 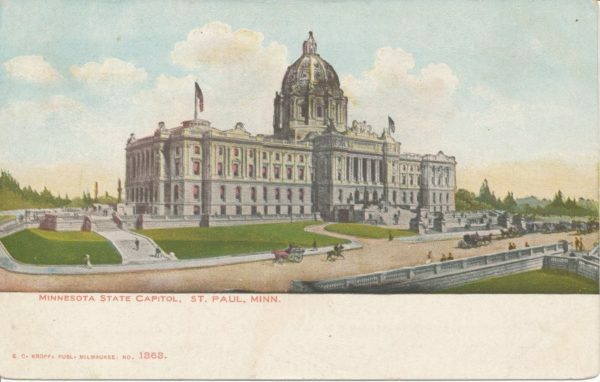 The state of Minnesota and the business and culture of beer underwent many major changes from statehood in 1858 and for the next 25-30 years. Doug Hoverson the author of Land of Amber Waters outlined these changes.